The year was 1971. It was Easter. You were watching yet another holdiay special, looking forward to when you could afford a TV with a remote control. Peter Cottontail came to town, and you were there. You watched the Rankin & Bass puppet animated TV movie, with Danny Kaye as the narrator, Vincent Price as the villain Irontail, and yes, Casey Kasem as the hero, Peter Cottontail. Well it's not 1971 anymore, except for in those hip stores on Melrose. This spring, through the magic of COMPUTER ANIMATION, comes the sequel to this classic TV chestnugget, and baby, it ROCKS. Tom "I'm Peter Cottontail" Kenny as our new hero, "Junior Cottontail"
With VOICE DIRECTION BY EVAN GORE! Ya get it? This is top-drawer! And not to mention Gore And Lombard.com's writing contributions to this boffo family film. 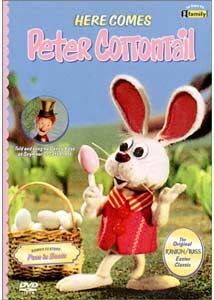 Peter Cottontail: The Movie should have a place on YOUR seder table next Passover.